(Lightweight Crank Pulley (Blue)) Built for the Scion xB... Self expression, fashion, function, style. These are all words that describe the Scion xB/xA and its owners. But like any car enthusiast, Scion xB/xA owners want power. 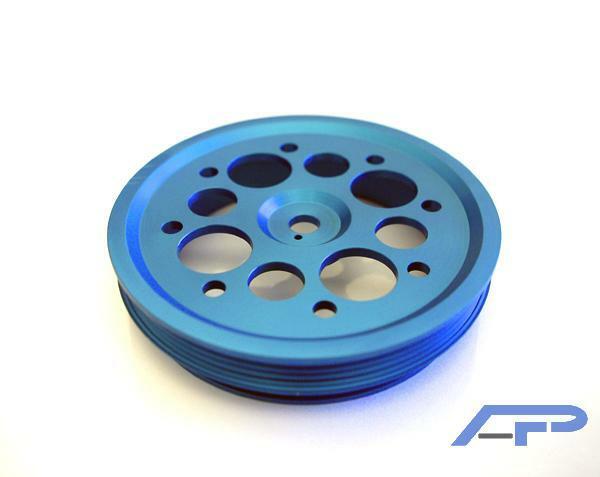 Agency Power has continued its success in performance products with a brand new lightweight crank pulley for your Scion xB/xA. This pulley saves almost 4 pounds over the stock unit. Since the pulley is kept the same diameter as stock, you retain the factory style belts and incur no alternator affects for your custom car stereo system. Less rotating mass equals faster throttle response, increase in horsepower, and torque. With this pulley on your Scion, you will see gains of up to 9 wheel horsepower as tested. The pulley is made from CNC machined T6061 aluminum that is anodized in red or blue, or can be purchased in our bright polished. The pulleys are balanced and tested to fit perfect every time, and are a direct replacement for your factory pulley.